What is the participation rate for your wellness program? Unless your company is one of the rare ones with over 65 percent involvement, technology may help to engage more employees. 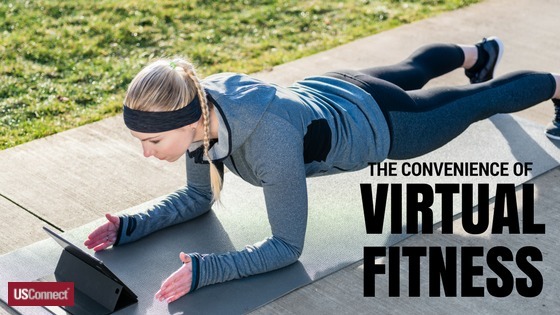 Specifically, virtual fitness training may provide the convenience and cost-effectiveness that has been missing until now. Fitness training is one of the many activities that has changed with the advent of the internet. Whereas meeting with a trainer once necessitated physically going to a gym or fitness studio, the internet has enabled real-time audio and video communication between trainers and clients. Virtual trainers work remotely with their clients, creating customized workouts and providing encouragement and guidance. These benefits are especially important in the realm of wellness programs, where they can increase participation and decrease costs to the company. A study published in the Harvard Business Review found that lack of awareness and inconvenience were the two most commonly stated reasons why employees do not participate in available wellness programs, with lack of employer support also playing a strong role. Survey respondents also cited a desire for programs to be personalized to them, not one-size-fits-all. In many ways, virtual training seems like a panacea for many problems of wellness program participation. However, more HR professionals know that there’s no such thing as a magic bullet. Virtual training programs are only as good as their trainers, and like in the real world, not all trainers are equally qualified. This makes online training especially risky, since meeting virtually could make it easier for trainers to fake their credentials. Also, fitness training might sometimes require in-person communication for trainers to help clients improve their form on certain exercises where poor form might cause injuries. This is especially true for beginners, who are likely to need more in-person support. If your wellness program numbers need a boost, investigate whether virtual trainers may help your employees take control and improve their health. The 1970s had EST(Erhard Seminar Training—described by psychologists as a large group awareness training program). The 1980s saw the rise of “The Me Generation.” For the current generation, one of the biggest cultural trends is mindfulness. Mindfulness is a state of active, open attention to the present, a state of living “in the moment,” and not being distracted by thoughts about the past or future. Although mindfulness is linked to ancient practices like yoga and meditation, it is only in recent decades that scientific studies are tying mindfulness to improved pain management, increased weight loss, enhanced productivity, and a host of other benefits. 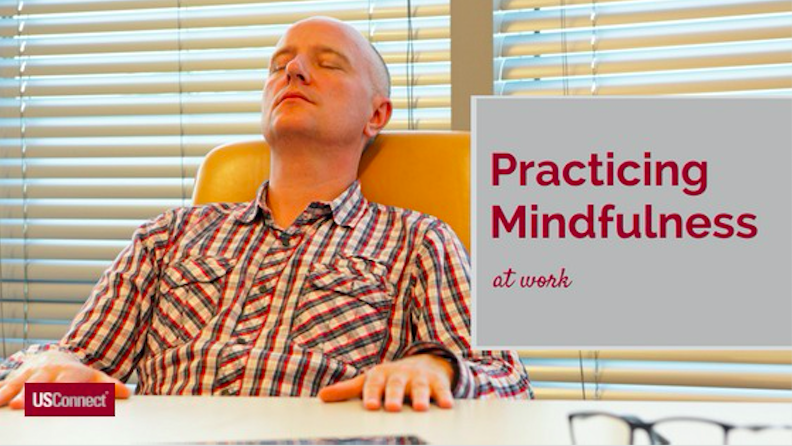 In order to reap the benefits of mindfulness, many companies are starting to implement mindfulness training programs. According to a study from the National Business Group on Health and Fidelity Investments, 22 percent of companies have mindfulness training programs in place, and another 21 percent of companies planned to add such programs in 2017. Although such programs can be costly, the financial benefits of reduced stress and increased productivity could offset those costs very quickly. Companies like General Mills, Google, Harvard, and Apple have used such programs, and their employees report positive impacts like improved decision-making and listening capabilities. Do one thing at a time, and stick to it until it’s done. Take a five-minute vacation by taking a tour of your senses. What do you see, hear, feel, smell, and taste at this particular moment? Practice “box breathing” (also known as “square breathing”) by breathing in for four seconds, holding your breath for four seconds, breathing out for four seconds, and holding again for four seconds. This calming breathing can soothe the flight-or-fight instinct that stress causes and help you get back to work. When you eat, focus on eating. Don’t multitask. Concentrate on your food, on the flavors and textures. Think about the journey the food made to get to your plate. Eat when you’re hungry, not according to the clock. Stop eating when you start to feel full, not when your plate is empty. At USConnect®, we want to help people reach their health goals. That’s why we offer so many fresh food options and our dietician-managed The Right Choice … for a Healthier You™ program. That’s also why we use this blog to dispel some health myths, like the idea that diet soda is healthy, or that anything with vegetables is good for you. 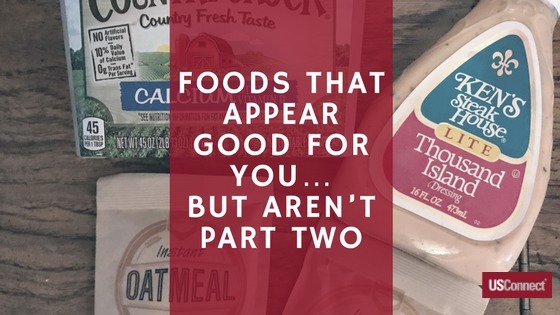 This post is a follow-up to our last Foods that Appear Good for You… But Aren’t article, where we help you avoid some common “health food” traps. Raw vegetables: healthy. Most bottled salad dressings: not so much. To make lettuce and other vegetables more palatable, most salad dressings rely on trans-fats, sugar, and artificial flavors. Further, prepared or restaurant salads are often drenched in the stuff, turning a potentially healthy meal into a nutritional disaster. One popular restaurant’s kale salad has 600 calories and a whopping 40 grams of sugar! For decades, marketers promoted margarine as a healthier option than butter because it contains less saturated fat, which some studies associated with higher risk of heart disease. More recent studies, however, suggest that trans fats, not saturated fats, are the culprit. Margarine is often laden with refined oils and trans fats, making it a less healthy option. Your best bet? Use butter sparingly, and don’t assume that margarine is a healthier option. Oatmeal may seem like a hearty, healthy breakfast, and it certainly can be. The rule, as with most packaged foods, is to read the nutritional information carefully. A popular instant maple and brown sugar oatmeal package, for instance, contains 12 grams of sugars, but only three grams of fiber and four grams of protein. To really keep you going until lunch, a bowl of oatmeal should have at least four grams of fiber and five grams of protein. And since the American Heart Association recommends that men eat no more than 36 grams and women eat no more than 25 grams of added sugar per day, try to cut your breakfast sugar intake to below six grams. 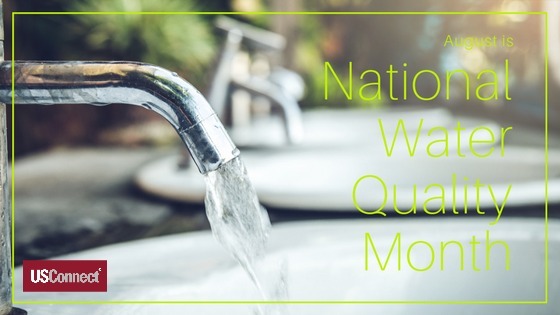 As summer’s hottest month heats up, the country celebrates National Water Quality Month. This month is a time to educate individuals and companies about steps they can take to protect the country’s sources of fresh water. State, federal, and local regulations govern the wastewater that companies can dump directly into water supplies. These regulations do not provide perfect protection—witness the 2014 coal ash spill into the Dan river—but they prevent companies from deliberately disposing of their waste products into the water. The more insidious impact, however, comes from the way that people add chemicals to the water supply without even knowing it. This happens through rainwater runoff, when water from rain storms collects in storm drains, bringing with it all the chemicals on buildings and sidewalks that it has encountered along the way. These storm drains then empty into water supplies—still carrying environmental pollutants. Don’t use antibacterial soaps or cleaning products. Don’t put anything except water down storm drains. Avoid using pesticides or chemical fertilizers. Sometimes water pollution is visible, like in the case of toxic algal blooms. More often, however, poor water quality is not visible to the naked eye. To make sure your office water supply is safe, check where your water comes from with the United States Environmental Protection Agency’s “Surf Your Watershed” tool, and buy a water quality testing kit. These standards from the General Services Administration provide good guidelines on making sure your water supply is safe. Unlike trendy superfoods (chia, seaweed, or coconut water, anyone? ), the movement toward increased consumption of fresh food—and rejection of packaged, processed products—looks like it’s here to stay. As we’ve been reporting for the past three years, millennials (people born between 1980 and 2000) are the primary drivers of this shift toward fresh, but people across generations and cultures are jumping on this wagon. This greater emphasis on freshness is evident in fast food chains, grocery stores, and workplaces, especially those with micro markets like USConnect’s Bistro To Go!®. The increased demand for fresh food has far-reaching implications for foodservice operations. The logistics of transporting and stocking fresh food is much more complicated than that of packaged foods with shorter shelf lives. This handy chart shows the shelf life of many common foods; note that while some fresh foods, like cheese, yogurt, and apples, can last up to a month in a refrigerator, other common workplace meals like lunch meat last only a week. To offer consumers longer shelf lives for their fresh foods, transportation speed is of the essence, and storage time needs to be minimal. This is creating a “paradigm shift” in the logistics business, with providers changing their business models to meet consumer demand. 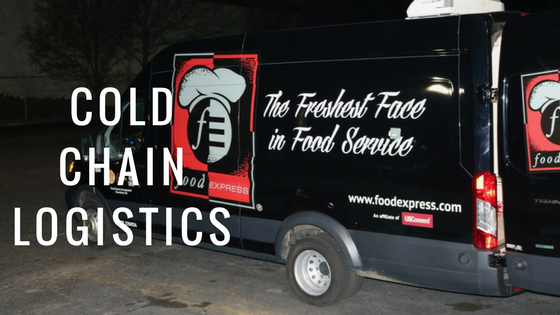 “Reefers”(refrigerated trucks) are becoming more and more common; the next one you see may be delivering your next fresh meal, so let it through!